Atlantic Coast S Gaugers - What's New on the ACSG Web Site? What's new on the ACSG web site? Added the Trackside Train Day page for the Carolinas Division. Updated the Show Schedule for the Carolinas Division. Updated the Show Schedule for the Washington & Old Dominion Division. Updated the Show Schedule for the Georgia Division. Added videos to the Boy Scout Train Show page for the Washington & Old Dominion Division. Added the Mebane Train Show page for the Carolinas Division. Added the Boy Scout Train Show page for the Washington & Old Dominion Division. Added more photos to the Carolina Coastal Railroaders Train Show page for the Carolinas Division. Updated the Show Schedule for the Tidewater Division. Added videos to the Carolina Coastal Railroaders Train Show page for the Carolinas Division. Added the Carolina Coastal Railroaders Train Show page for the Carolinas Division. Added a video to the Greenberg Train Show page for the Washington & Old Dominion Division. Added more photos to the Greenberg Train Show page for the Washington & Old Dominion Division. Added the Greenberg Train Show page for the Washington & Old Dominion Division. Added more photos and videos to the C & O Historical Society Train Show page for the Tidewater Division. Added the C & O Historical Society Train Show page for the Tidewater Division. Added videos to the Richmond Greenberg Train Show page for the Tidewater Division. Added Mark Laszlo's page to the Northern Florida Division. Added the Richmond Greenberg Train Show page for the Tidewater Division. Updated the Show Schedule for the Northern Florida Division. Added the Virginia Beach Greenberg Train Show page for the Tidewater Division. Added videos to the Norfolk Council Holiday Train Display page for the Tidewater Division. Added a video to the Kannapolis Christmas page for the Carolinas Division. Added the Norfolk Council Holiday Train Display page for the Tidewater Division. Updated the Show Schedule for the Elizabeth City Division. Added more photos to the Christmas 2018 event for the Elizabeth City Division. Added more photos to the Christmas Layouts and Trees pages. Added the Kannapolis Christmas page for the Carolinas Division. Added more videos to the Christmas Layouts and Trees pages. Added the Christmas 2018 event for the Elizabeth City Division. Added the link to the Christmas Layouts and Trees pages. Added the Jingle on Main page for the Carolinas Division. Added a video to the TCA Christmas Meet page for the Carolinas Division. Added the TCA Christmas Meet page for the Carolinas Division. Added the Trains and Planes page for the Tidewater Division. Added the 33rd annual Shenandoah Valley Train Show to the Blue Ridge of Virginia Division page. Added the 2019 edition of the American Flyer Pocket Price Guide to the Greenberg Books page. Added a video to the Cornelius Tree Lighting Event page for the Carolinas Division. Added the Cornelius Tree Lighting Event page for the Carolinas Division. Added a video to the CHKD Event page for the Carolinas Division. Added a video to the CHKD Event page for the Tidewater Division. Added the CHKD Event page for the Carolinas Division. Added the CHKD Event page for the Tidewater Division. Added the Neuse River Valley Train Club Train Show page for the Carolinas Division. Added a video to the Day Out with Thomas page for the Carolinas Division. Added the Day Out with Thomas page for the Carolinas Division. Added the Trains, Trains, and More Trains page for the Carolinas Division. Added the Train Display page for the Tidewater Division. Added a video to the Lynchburg Rail Day page for the Carolinas Division. Added the Lynchburg Rail Day page for the Carolinas Division. Added more photos and video to George Cooper's Layout page. Added a video to the Greenberg Train Show page for the Tidewater Division. Updated the video on the C & O Train Show page for the Tidewater Division. Added more photos and video to the C & O Train Show page for the Tidewater Division. Updated the photos and videos on Marvin Thiel's Layout page. Added Chris Rooney's page to the Northern Florida Division. Added a video to the National Train Day Show page for the Tidewater Division. Added the National Train Day Show page for the Tidewater Division. Added more photos to the Historic Spencer Shops Train Show page for the Carolinas Division. Added a video of the 32nd Shenandoah Valley Train Show to the Blue Ridge of Virginia Division page. Added the Historic Spencer Shops Train Show page for the Carolinas Division. Added the Shenandoah Valley Train Show page for the Carolinas Division. Added photos of the 32nd Shenandoah Valley Train Show to the Blue Ridge of Virginia Division page. Added the Neuse River Valley Spring Train Show page for the Carolinas Division. Added the Sparkleberry Country Fair page for the Carolinas Division. Added the Currituck High School Agriculture Day photos for the Elizabeth City Division. Added videos to the Greenberg Train Show page for the Tidewater Division. Added the Greenberg Train Show page for the Tidewater Division. Added a video to the Mebane Train Show page for the Carolinas Division. Added a video to the Carolina Coastal Railroaders Train Show page for the Carolinas Division. Added the train ride video to the C & O Train Show page for the Tidewater Division. Added videos to the C & O Train Show page for the Tidewater Division. Added the C & O Train Show page for the Tidewater Division. Added the Berkshire locomotive video to the Lionel Ambassador Program page for the Carolinas Division. Added videos to the World's Greatest Hobby page for the Carolinas Division. Added the 32nd Shenandoah Valley Train Show to the Blue Ridge of Virginia Division page. Added the World's Greatest Hobby page for the Carolinas Division. Added the thank you note to the Celebration of Lights page for the Carolinas Division. Added another video to the Celebration of Lights page for the Carolinas Division. Added videos to the Downtown Norfolk Christmas Train Exhibit page for the Tidewater Division. Added the Downtown Norfolk Christmas Train Exhibit page for the Tidewater Division. Added a video to the Burlington Holiday Trains page for the Carolinas Division. Added the Burlington Holiday Trains page for the Carolinas Division. Added more photos to the Celebration of Lights page for the Carolinas Division. Added the Celebration of Lights page for the Carolinas Division. Added another photo to running trains at Kenyon Bailey for the Elizabeth City Division. Added videos to the TCA Meet page for the Carolinas Division. Added the TCA Meet page for the Carolinas Division. Added the Planes Trains & Santa page for the Tidewater Division. Added a video to the Light Up Cornelius page for the Carolinas Division. Added the Light Up Cornelius page for the Carolinas Division. Added more photos to running trains at Kenyon Bailey for the Elizabeth City Division. Added running trains at Kenyon Bailey for the Elizabeth City Division. Added another photo to the 2017 layout construction photos for the Elizabeth City Division. Added a video to the CHKD Breakfast with Santa page for the Carolinas Division. Added the CHKD Breakfast with Santa page for the Carolinas Division. Added the 2017 layout construction photos to the Elizabeth City Division. Added the newspaper photo to the Beaches Museum Train Day page for the Northern Florida Division. Added the CHKD Breakfast with Santa page for the Tidewater Division. Added videos to the Neuse River Valley Train Show page for the Carolinas Division. Added the Neuse River Valley Train Show page for the Carolinas Division. Added the Beaches Museum Train Day page for the Northern Florida Division. Updated the Northern Florida Division home page. Added another video of the New Market Fall Festival to the Blue Ridge of Virginia Division page. Added the Elizabeth City Division. Added more photos to Tom Robinson's Tennessee Central pages. Added the NMRA Train Show page for the Tidewater Division. Added a video of the New Market Fall Festival to the Blue Ridge of Virginia Division page. Updated the ACSG Brochure on the ACSG home page. Added videos to the Trains, Trains, and More Trains page for the Carolinas Division. Added the Trinity United Methodist Church Train Show page for the Tidewater Division. Added videos to the NASG Convention page for the Tidewater Division. Added the NASG Convention page for the Carolinas Division. Added the NASG Convention page for the Tidewater Division. Added the NYC Hudson w/ centipede tender page to Joe Deger's set of pages. Added the Manassas Railway Festival page for the Washington & Old Dominion Division. Added the GoldinHands Repair and Conversions link to the Favorite Links page. Added videos to the Spencer Train Shows page for the Carolinas Division. Added a video to the Shenandoah Valley Train Show page for the Carolinas Division. Added the Spencer Train Shows page for the Carolinas Division. Added a video of the Shenandoah Valley Train Show to the Blue Ridge of Virginia Division page. Added the Shenandoah Valley Train Show to the Blue Ridge of Virginia Division page. Added a video to the York TCA Meet page for the Washington & Old Dominion Division. Added the York TCA Meet page for the Washington & Old Dominion Division. Added a video to the Boy Scout Train Show page for the Washington & Old Dominion Division. Added the Division Meeting page for the Northern Florida Division. Added photos and videos to Marvin Thiel's Layout page. Added the 2017 edition of the American Flyer Pocket Price Guide to the Greenberg Books page. Added a video to the Kannapolis Xmas Event page for the Carolinas Division. Added more videos to the Norfolk Model Train Exhibit page for the Tidewater Division. Added more photos to the Kannapolis Xmas Event page for the Carolinas Division. Added the Norfolk Model Train Exhibit page for the Tidewater Division. Added another photo to the Elizabeth City page for the Tidewater Division. Added the Elizabeth City page for the Tidewater Division. Added the Kannapolis Xmas Event page for the Carolinas Division. Added videos to the TCA Christmas Meet page for the Carolinas Division. Added the CHKD Cider with Santa page for the Tidewater Division. Added videos to the Planes, Trains, and Santa show page for the Tidewater Division. Added the Planes, Trains, and Santa show page for the Tidewater Division. Added the Cornelius Christmas Tree Lighting page for the Carolinas Division. Added the combined train show schedule to the ACSG main page. Updated Butch Henion's page with new photos. Added videos to the NMRA Train Show page for the Tidewater Division. Added the About the Washington & Old Dominion Division page. Added more photos and videos to the Day Out with Thomas page for the Carolinas Division. Updated the Favorite Links page. Added videos to the Great Train Show page for the Carolinas Division. Added videos to the Trains, Trains, Trains page for the Carolinas Division. Added the Great Train Show page for the Carolinas Division. Added the Trains, Trains, Trains page for the Carolinas Division. Added the Work Day Photos page for the Washington & Old Dominion Division. Updated the Washington & Old Dominion Division home page. Added videos to the Historic Spencer Shops Train Show page for the Carolinas Division. Added the Trinity UMC Train Show page for the Tidewater Division. Added another new video to Paul Sharp's layout page. Added 2 new videos to Paul Sharp's layout page. Moved the ACSG web site to a new web server and registered the sgaugers.org address. Added the train show schedule to the Northern Florida Division home page. Added replacement smoke unit videos to Jeff Hill's layout page. Added more photos to the Boy Scout Train Show page for the Washington & Old Dominion Division. Added the Tampa Model Train Show page for the Northern Florida Division. Added Marvin Thiel's Layout page. Added more photos to George Cooper's Layout page. Updated the navigation and links on the main ACSG page and division pages. Added the National Train Day page for the Carolinas Division. Added more photos to the TCA Meet page for the Carolinas Division. Added videos to the Greenberg's Train and Toy Show page for the Tidewater Division. Added the Tampa Show Flyer to the Northern Florida Division home page. Added the Mebane Train Group Show page for the Carolinas Division. Added the Greenberg's Train and Toy Show page for the Tidewater Division. Added videos to the C&O Historical Society Train Show page for the Carolinas Division. Added videos to the C&O Historical Society Train Show page for the Tidewater Division. Added the C&O Historical Society Train Show page for the Carolinas Division. Added the C&O Historical Society Train Show page for the Tidewater Division. Added printable PDF links to the Module Specifications pages. Added the Ball Ground Train Show page for the Georgia Division. Added the Atlanta Train and Railroadiana Show page for the Georgia Division. Added more photos to the Norfolk Council Holiday Train Display page for the Tidewater Division. Added another video to the Burlington Holiday Magic page for the Carolinas Division. Added another video to the Norfolk Council Holiday Train Display page for the Tidewater Division. Added the December Train Shows page for the Washington & Old Dominion Division. Added Jeff Hill's Custom Gondola Loads page. Added the Burlington Holiday Magic page for the Carolinas Division. Added the A Kannapolis Christmas page for the Carolinas Division. Added a video to the TCA Meet page for the Carolinas Division. Added videos to the Trains and Planes Show page for the Tidewater Division. Added a video to the Cornelius Christmas Tree Lighting page for the Carolinas Division. Added the Trains and Planes Show page for the Tidewater Division. 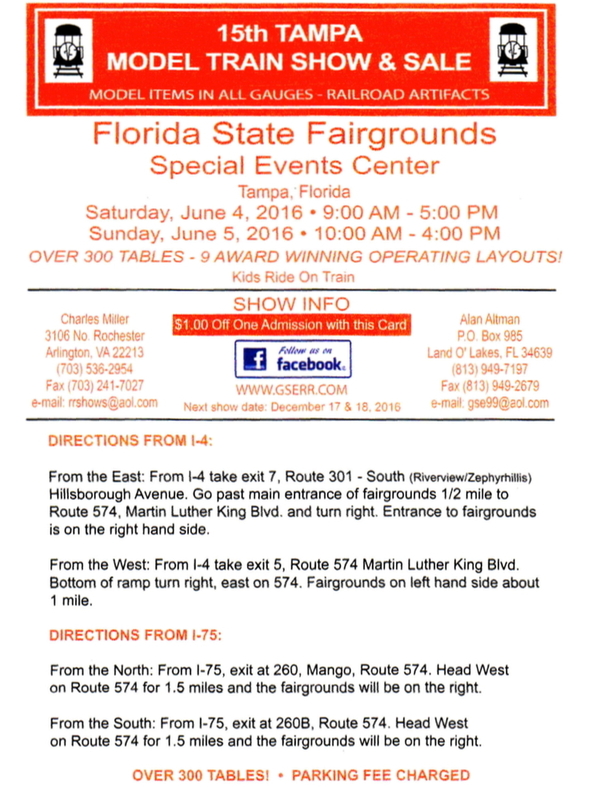 Added the TCA Southern Division Show page for the Northern Florida Division. Added the Holiday Train Display link to the Show Schedule for the Tidewater Division. Added the Children's Hospital of the Kings Daughters (CHKD) Event page for the Tidewater Division. Added the Erie Steam Railsounds Boxcar article to the Lionel Ambassador Program page. Added the Kettle Creek Lumber Company 2-4-4-2 page to Joe Deger's set of pages. Added the Reading 4-4-2 Camelback page to Joe Deger's set of pages. Added the Ambush Shack article to the Lionel Ambassador Program page. Added more videos to the Day Out with Thomas - Week 2 page for the Carolinas Division. Added a video to the Day Out with Thomas - Week 2 page for the Carolinas Division. Added a video to the Day Out with Thomas - Week 1 page for the Tidewater Division. Added the Day Out with Thomas - Week 2 page for the Carolinas Division. Added a video to the Day Out with Thomas - Week 1 page for the Carolinas Division. Added a the Day Out with Thomas - Week 1 page for the Tidewater Division. Added a the Day Out with Thomas - Week 1 page for the Carolinas Division. Added a the Mauldin Train Show - Week 2 page for the Carolinas Division. Added a the Mauldin Train Show - Week 1 page for the Carolinas Division. Added the Greenville News article to the Carolinas Division home page. Added Robbie Maier's Layout page. Added the Reversing Handcar article to the Lionel Ambassador Program page. Added a video to the Historic Spencer Shop Train Show page for the Carolinas Division. Added the Historic Spencer Shop Train Show page for the Carolinas Division. Added the transformer comparison article to the Lionel Ambassador Program page. Added photos to the Railroad Rendezvous page for the Georgia Division. Added the Railroad Rendezvous page for the Georgia Division. Added videos to the 611 Event page for the Carolinas Division. Updated the home page for the Carolinas Division. Added the 611 Event page for the Carolinas Division. Added the Rail Days page for the Carolinas Division. Added a video to the C & O Historical Society Train Show page for the Carolinas Division. Added the C & O Historical Society Train Show page for the Carolinas Division. Added the 611 Send Off Party page for the Carolinas Division. Added the Terminus Chapter TCA Meet page for the Georgia Division. Added videos to the National Train Day page for the Carolinas Division. Added another video to the Shenandoah Valley Train Show page for the Carolinas Division. Added a video to the Shenandoah Valley Train Show on the Blue Ridge of Virginia Division page. Added Jeff Hill's U.P. 4-8-4 Northern page. Added "A Railroader's Prayer" to the page for Joe Haenn. Added more photos to the Easter Bunny Express page for the Carolinas Division. Added a video to the Easter Bunny Express page for the Carolinas Division. Added photos to the Boy Scout Train Show page for the Washington & Old Dominion Division. Added photos and a video to the Greenberg Train Show page for the Washington & Old Dominion Division. Added the Easter Bunny Express page for the Carolinas Division. Updated the contact info for the Carolinas Division. Updated the contact info for the Virginia Central Division. Added a video to the Wilroy Baptist Church Train Expo page for the Tidewater Division. Added more photos to the page for Joe Haenn. Added the Wilroy Baptist Church Train Expo page for the Tidewater Division. Added a page for Joe Haenn. Updated some old YouTube video links. Added videos to the Mebane Train Show page for the Carolinas Division. Added videos to Jeff Hill's NKP 0-8-0 page. Updated the Northern Florida Division meeting day to the 3rd Saturday. Added more videos to the Greenberg Train Show page for the Tidewater Division. Added Jeff Hill's NKP 0-8-0 page. Added the B & O Holiday Festival page for the Washington & Old Dominion Division. Added the January TCA Meet page for the Carolinas Division. Added more photos to the Worlds Greatest Hobby Show page for the Washington & Old Dominion Division. Added more videos to the Worlds Greatest Hobby Show page for the Carolinas Division. Added The Super 8 Layout page. Added more photos and a video to the Worlds Greatest Hobby Show page for the Carolinas Division. Added a news article to the main page for the Tidewater Division. Added the Worlds Greatest Hobby Show page for the Carolinas Division. Added videos to the Worlds Greatest Hobby Show page for the Tidewater Division. Added more photos to the Worlds Greatest Hobby Show page for the Tidewater Division. Added the Worlds Greatest Hobby Show page for the Tidewater Division. Added the Worlds Greatest Hobby Show page for the Washington & Old Dominion Division. Added more videos to the Holiday Model Train Display page for the Carolinas Division. Added more videos to the Christmas TCA Meet page for the Carolinas Division. Added a video to the Christmas TCA Meet page for the Carolinas Division. Added another video to the Holiday in the City Celebration page for the Tidewater Division. Added the Thiel's Train around the Christmas Tree. Added more photos and videos to the Holiday in the City Celebration page for the Tidewater Division. Added the Holiday Model Train Display page for the Carolinas Division. Added a video to the Holiday in the City Celebration page for the Tidewater Division. Added another video to Jeff's Illinois Central diesel freight units page. Added the Holiday in the City Celebration page for the Tidewater Division. Added the Christmas TCA Meet page for the Carolinas Division. Added videos to the Cornelius Christmas Tree Lighting page for the Carolinas Division. Added videos to the Military Aviation Museum Show page for the Tidewater Division. Added the Military Aviation Museum Show page for the Tidewater Division. Added another video to the Neuse River Train Club Show page for the Carolinas Division. Added the CHKD Breakfast with Santa Show page for the Tidewater Division. Added a video to the Neuse River Train Club Show page for the Carolinas Division. Added the Neuse River Train Club Show page for the Carolinas Division. Expanded and rearranged Jeff Hill's layout and engines pages. Added the Hemlock, Selkirk and Troy 18 page to Joe Deger's set of pages. Added the Brunswick Railroad Days page for the Washington & Old Dominion Division. Added meeting photos to the main page for the Washington & Old Dominion Division. Added another video to the Day Out with Thomas Show page for the Carolinas Division. Added two videos to the Day Out with Thomas Show page for the Carolinas Division. Added two more videos to the Historic Spencer Shops Train Show page for the Carolinas Division. Added two videos to the Historic Spencer Shops Train Show page for the Carolinas Division. Added the Day Out with Thomas Show page for the Carolinas Division. Added another video to the NMRA Train Show page for the Tidewater Division. Added a video to the Mauldin Train Show page for the Carolinas Division. Added more photos to the Mauldin Train Show page for the Carolinas Division. Added the Mauldin Train Show page for the Carolinas Division. Added another video to Jeff Hill's Layout page. Added the Reading Pacific 4-6-2 page to Joe Deger's set of pages. Added the 2015 edition of the American Flyer Pocket Price Guide to the Greenberg Books page. Added the TCA Meet Train Show page for the Carolinas Division. Added videos to the Greenberg Train Show page for the Washington & Old Dominion Division. Added another video to Joe Deger's Union Pacific 4-12-2 page. Added the AC Gilbert Heritage Society Convention page for the Georgia Division. Added more navigation links to the ACSG home page. Added more videos to the C&O Historical Society Train Show page for the Tidewater Division. Added a video to the Shenandoah Train Show page for the Carolinas Division. Added the Shenandoah Valley Train Show to the Recent Shows page for the Virginia Central Division. Added the Shenandoah Train Show page for the Carolinas Division. Added videos to the Easter Bunny Express page for the Carolinas Division. Added more videos to the Mebane Train Show page for the Carolinas Division. Added the Spring Kick-Off page for the Carolinas Division. Added more videos to the Greenberg Train Show page for the Washington & Old Dominion Division. Added the Division Brochure to Washington & Old Dominion Division page. Added Lego Trains to Joe Deger's Erector Sets page. Added the Union Pacific 4-12-2 page to Joe Deger's set of pages. Added pictures and video of the long tender project to Joe Deger's NYC Mohawk page. Added videos to the Columbus Great Train Expo page for the Carolinas Division. Added Larry Shughart's page to the Northern Florida Division. Updated the Northern Florida Division meeting day to the 4th Saturday. Removed the Christmas Layouts and Trees pages until Christmas 2014. Added another photo to George Cooper's Layout page. Added the Columbus Great Train Expo page for the Carolinas Division. Added the George Cooper's Layout page. Added the Cooper family's Train around the Christmas Tree. Added the Deger family's Train around the Christmas Tree. Added the "cell phone flatcar" video to Jeff Hill's Layout page. Added Ken McNelly's son's Train around the Christmas Tree. Added Butch Henion's pictures to the Christmas Layouts and Trees pages. Added Marvin Thiel's Train around the Christmas Tree. Added more videos to the Holiday in the City Celebration page for the Tidewater Division. Added the Kannapolis Winter Festival page for the Carolinas Division. Added videos to the Holiday in the City Celebration page for the Tidewater Division. Added another video to the Trains and Planes Show page for the Tidewater Division. Added more photos and videos to the Trains and Planes Show page for the Tidewater Division. Added the Northern Florida Division back into the web site. Added Lloyd Lippert's page to the Northern Florida Division. Added a video to the Thompson's Train Show page for the Carolinas Division. Added more videos to the Neuse River Valley Train Club Show page for the Carolinas Division. Added the Thompson's Train Show page for the Carolinas Division. Added videos to the Neuse River Valley Train Club Show page for the Carolinas Division. Updated the division coordinator for the Washington & Old Dominion Division. Added more photos to the Neuse River Valley Train Club Show page for the Carolinas Division. Added the Neuse River Valley Train Club Show page for the Carolinas Division. Added another video to the Joe Deger's New York Central 4-6-4 Hudson page. Added the Manchester Railroad Days page for the Georgia Division. Added a video to the Joe Deger's Pennsylvania 0-6-0 page. Added the Pennsylvania 2-8-2 page to Joe Deger's set of pages. Added the New York Central 4-6-4 Hudson page to Joe Deger's set of pages. Added the Pennsylvania 0-6-0 page to Joe Deger's set of pages. Added the first and third editions of the American Flyer S Gauge Repair and Operating Manual to the Greenberg Books page. Added videos to the Day Out with Thomas Train Show page for the Carolinas Division. Added more photos to the Day Out with Thomas Train Show page for the Carolinas Division. Added the Day Out with Thomas Train Show page for the Carolinas Division. Fixed the video link on Joe Deger's Pennsylvania 4-6-0 G-5 page. Added more photos to the NMRA Train Show page for the Tidewater Division. Added more videos to the Historic Spencer Shops Train Show page for the Carolinas Division. Added videos to the TCA Meet Train Show page for the Carolinas Division. Added the 2013 edition of the American Flyer Pocket Price Guide to the Greenberg Books page. Added two more videos to the Mauldin Train Show page for the Carolinas Division. Added the Museum in Motion page for the Carolinas Division. Added the Blue Ridge of Virginia Division. Added a video to the Shenandoah Valley Club Train Show page for the Carolinas Division. Added a video to the Raleigh TCA Meet page for the Carolinas Division. Added videos to the Sparkleberry Country Fair page for the Carolinas Division. Added another video of the Royal Blue to Joe Deger's Royal Blue train page. Added four more videos to Jeff Hill's Layout page. Added the Shenandoah Valley Club Train Show page for the Carolinas Division. Added the Raleigh TCA Meet page for the Carolinas Division. Added the Virginia Museum of Transportation Train Show page for the Carolinas Division. Added videos to the Pullen Park Easter Egg Hunt page for the Carolinas Division. Added the Pullen Park Easter Egg Hunt page for the Carolinas Division. Added videos to the Mebane Train Show and Sale page for the Carolinas Division. Added the Mebane Train Show and Sale page for the Carolinas Division. Added to the Children's Museum of Virginia Show page for the Tidewater Division. Added the Spring Kick-Off Train Show page for the Carolinas Division. Added videos to the C & O Train Show page for the Carolinas Division. Added the C & O Train Show page for the Carolinas Division. Removed the Christmas Layouts and Trees pages until Christmas 2013. Added another video to Joe Deger's HS&T engines and cars page. Added two more videos to Jeff Hill's Layout page. Added more photos to the Kannapolis Winter Festival show page for the Carolinas Division. Added the Christmas Layouts and Trees pages. Added the Kannapolis Winter Festival show page for the Carolinas Division. Added Tom Robinson's 2-8-8-2 page to the Georgia Division members pages. Added a video to Jeff Hill's Layout page. Added the Planes and Trains Show page for the Tidewater Division. Added a video to the Galax Train Fair page for the Carolinas Division. Added the Galax Train Fair page for the Carolinas Division. Added videos to the Thompson's Model Train Show page for the Carolinas Division. Added the Thompson's Model Train Show page for the Carolinas Division. Added videos to the Railfest Show page for the Carolinas Division. Added videos to the Railfest Show page for the Tidewater Division. Added the Railfest Show page for the Carolinas Division. Added the Railfest Show page for the Tidewater Division. Added more videos to the Day Out With Thomas Show page for the Carolinas Division. Added more videos to the Day Out With Thomas Show page for the Tidewater Division. Added videos to the Day Out With Thomas Show page for the Carolinas Division. Added videos to the Day Out With Thomas Show page for the Tidewater Division. Added more photos to the Day Out With Thomas Show page for the Carolinas Division. Added more photos to the Day Out With Thomas Show page for the Tidewater Division. Added the Day Out With Thomas Show page for the Tidewater Division. Added a video to Joe Deger's NYC Mohawk page. Added a video to Joe Deger's Pennsylvania M1 page. Added a video to Joe Deger's Reading 4-4-2 page. Added more photos to the NASG Convention page for the Carolinas Division. Added more photos to the NASG Convention page for the Georgia Division. Added the NASG Convention page for the Georgia Division. Added another video to the TCA Meet page for the Carolinas Division. Added a video to Joe Deger's Pennsylvania K-4 page. Added a video to Joe Deger's Pennsylvania E-6 page. Added Train Work Day 2012 pictures to the About the Carolinas Div. page. Added the TCA National Convention Show page for the Georgia Division. Added the Speed and Directional Control of American Flyer Trains link to the Favorite Links page. Added the Tom Robinson's Tennessee Central 2012 page to the Georgia Division members pages. Added more videos to Jeff Hill's Layout page. Added more videos to the Mauldin Train Show page for the Carolinas Division. Added videos to the Rail Days page for the Carolinas Division. Added videos to the Rail Days page for the Tidewater Division. Added the Rail Days page for the Tidewater Division. Added a video to the Norfolk Southern Event page for the Carolinas Division. Added the Norfolk Southern Event page for the Carolinas Division. Updated the Carolinas Division schedule. Added a video to Joe Deger's Selkirk Arrow train page. Added videos to Joe Deger's HS&T engines and cars page. Moved the information about the Delaware Division and the Northern Florida Division to the About the ACSG page. Removed the dormant Delaware and Northern Florida divisions from the web site. Added videos to the Great Train Expo page for the Carolinas Division. Added the Great Train Expo page for the Carolinas Division. Updated the pictures on Paul Sharp's layout page. Added more photos and videos to the Greenberg Train Show page for the Tidewater Division. Added the Train Race video to the Greenberg Train Show page for the Tidewater Division. Updated Jeff Hill's Layout page with new photos and videos. Updated the C & O Historical Society Show page for the Carolinas Division. Updated the C & O Historical Society Show page for the Tidewater Division. Added photos of the new building and layout to Vance Kinlaw's member page. Added the C & O Historical Society Show page for the Carolinas Division. Added the C & O Historical Society Show page for the Tidewater Division. Added pictures to the TCA Meet page for the Carolinas Division. Removed the Christmas Layouts and Trees pages until Christmas 2012. Added the Tom Robinson's U33C page to the Georgia Division members pages. Updated the video on Joe Deger's Circus Train page. Added the Santa Train Show page for the Carolinas Division. Added the Downtown Norfolk Show page for the Tidewater Division. Added videos to the Xmas Party page for the Tidewater Division. Added the TCA Meet to the Recent Shows page for the Carolinas Division. Added the Xmas Party page for the Tidewater Division. Added Richard Norman's Member Layout page to the Tidewater Division. Added more videos to Joe Deger's pages. Added 13News link to the Tidewater Division main page. Added the Tom Robinson's Challenger page to the Georgia Division members pages. Added a video to Jeff Hill's page. Added 2005 NASG Convention video to the About the Carolinas Div. page. Added more photos and videos to Joe Deger's page. Added S Yahoo Groups to the Favorite Links page. Added videos to the Day Out with Thomas page for the Carolinas Division. Added videos to the Day Out with Thomas page for the Tidewater Division. Added the Day Out with Thomas page for the Tidewater Division. Added Train Camp 2011 pictures to the About the Carolinas Div. page. Added videos to Paul Sharp's layout page. Replaced all the pictures on Paul Sharp's layout page. Added videos to the S South Train Show page for the Carolinas Division. Added videos to the S South Train Show page for the Tidewater Division. Added videos to the S South Train Show page for the Virginia Central Division. Added the S South Train Show page for the Carolinas Division. Added the S South Train Show page for the Tidewater Division. Added the S South Train Show page for the Virginia Central Division. Updated the S South page. Added another Train Show Calendar link to the Favorite Links page. Added videos to the Rail Days Train Show page for the Carolinas Division. Added videos to the Rail Days Train Show page for the Tidewater Division. Added the Rail Days Train Show page for the Tidewater Division. Added the Rail Days Train Show page for the Carolinas Division. Added the Train Show Calendars section to the Favorite Links page. Added videos from "week 2" to the Mauldin Train Show page for the Carolinas Division. Added the S South page. Added the Greenberg Books page. Added photos from "week 2" to the Mauldin Train Show page for the Carolinas Division. Added videos to the Mauldin Train Show page for the Carolinas Division. Added videos to the Shenandoah Valley Railroad Club Model Train & Railroading Show page for the Carolinas Division. Added the Shenandoah Valley Railroad Club Model Train & Railroading Show page for the Carolinas Division. Added videos to the Antique Machinery and Vehicle Show page for the Carolinas Division. Added the Antique Machinery and Vehicle Show page for the Carolinas Division. Added more videos to the Greenberg Train & Toy Show page for the Tidewater Division. Added videos to the Carolina Coastal Train Show page for the Carolinas Division. Added videos to the Carolina Coastal Train Show page for the Tidewater Division. Added the Carolina Coastal Train Show page for the Carolinas Division. Added the Carolina Coastal Train Show page for the Tidewater Division. Added another video to the C & O Train Show page for the Carolinas Division. Added another video to the C & O Train Show page for the Tidewater Division. Added a video to the C & O Train Show page for the Carolinas Division. Added a video to the C & O Train Show page for the Tidewater Division. Added more pictures to the Greenberg Train & Toy Show page for the Tidewater Division. Added the Greenberg Train & Toy Show page for the Tidewater Division. Added another video to the Greenberg Train Show page for the Washington & Old Dominion Division. Added the World's Greatest Hobby Train Show page for the Georgia Division. Updated Sam's e-mail address on the About the Virginia Central Division page. Added Jeff's picture to the About the Tidewater Division page. Updated the Module Specifications pages. Added the Railroadiana Train Show page for the Georgia Division. Removed the Christmas Layouts and Trees pages until Christmas 2011. Added Harold (Butch) Henion to the Carolinas Division Member's Layouts. Added videos to the Kannapolis Winterland Festival page for the Carolinas Division. Added the Kannapolis Winterland Festival page for the Carolinas Division. Added the TCA Meet page for the Georgia Division. Added the Thompson's Old Fashioned Model Train Show page for the Carolinas Division. Added videos to the Neuse River Valley Model Railroad Club Show page for the Carolinas Division. Added the Great Train Expo Show page for the Georgia Division. Added the Neuse River Valley Model Railroad Club Show page for the Carolinas Division. Added more pictures and videos to the NMRA Train Show page for the Carolinas Division. Added the NMRA Train Show page for the Carolinas Division. Added the Walter Reed Military Medical Center show to the Washington & Old Dominion Division home page. Added the Greenberg Show to the Washington & Old Dominion Division home page. Added the Manchester Rail Days page for the Georgia Division. Added another video to Day Out with Thomas page for the Carolinas Division. Added another video to Day Out with Thomas page for the Tidewater Division. Added a video to Day Out with Thomas page for the Carolinas Division. Added a video to Day Out with Thomas page for the Tidewater Division. Added more videos to the NMRA Train Show page for the Tidewater Division. Added more pictures to the NMRA Train Show page for the Tidewater Division. Added Train Camp 2010 pictures to the About the Carolinas Div. page. Added link to more pictures to the Railroadiana Train Show page for the Georgia Division. Added the TCA Convention page for the Carolinas Division. Added the TCA Convention page for the Tidewater Division. Added the TCA Convention page for the Washington & Old Dominion Division. Added videos and more photos to the Rail Days page for the Carolinas Division. Added a video of the Erector Sets to Joe Deger's page. Added more videos to the Trains, Trains, and more Trains show page for the Carolinas Division. Added more pictures to the Trains, Trains, and more Trains show page for the Carolinas Division. Added videos to the Trains, Trains, and more Trains show page for the Carolinas Division. Added the Trains, Trains, and more Trains show page for the Carolinas Division. Added the Mauldin Train Show Flyer to the Show Schedule for the Carolinas Division. Added videos to the Great Train Expo Show page for the Carolinas Division. Added the Great Train Expo Show page for the Carolinas Division. Added link to more pictures to the NMRA Piedmont Division Train Show page for the Georgia Division. Added link to more pictures to the Great Train Expo Show page for the Georgia Division. Added the NMRA Piedmont Division Train Show page for the Georgia Division. Added videos to the Coastal Carolinas Train Show page for the Carolinas Division. Added videos to the Coastal Carolinas Train Show page for the Tidewater Division. Added the Coastal Carolinas Train Show page for the Carolinas Division. Added the Coastal Carolinas Train Show page for the Tidewater Division. Added the Great Train Expo page for the Georgia Division. Added a video of the Pennsylvania 4-4-2 E-6 to Joe Deger's page. Added pictures of Joe's Tuscan K-4 and PRR 4-6-0 K-5 to Joe Deger's page. Added link to more pictures to the C & O Train Show page for the Carolinas Division. Added link to more pictures to the C & O Train Show page for the Tidewater Division. Added the February TCA Meet page for the Carolinas Division. Removed the Christmas Layouts and Trees pages until Christmas 2010. Added another picture of Joe's Mohawk to Joe Deger's page. Added more pictures to the Christmas Layouts and Trees pages. Added the Union Pacific Big Boy on Tom Robinson's Tennessee Central page to the Georgia Division members pages. Added the Neuse River Valley Model Railroad Train Club Show page for the Carolinas Division. Added pictures and videos to the Greenberg Train Show page for the Tidewater Division. Added the Manchester Railroad Days Show page for the Georgia Division. Added more pictures to Joe Deger's page. Added Joe Deger to the Tidewater Division Member's Layouts. Added the Raleigh Great Train Expo page for the Carolinas Division. Added pictures of Tom Robinson's layout to the member's page for the Georgia Division. Added the Atlanta Model Train and Railroadiana Show page for the Georgia Division. Added Work Day 2009 pictures to the About the Carolinas Div. page. Added more photos & videos to the Mauldin, SC Train Show page. Added the Rail Days Show page for the Carolinas Division. Added the Rail Days Show page for the Tidewater Division. Added the Mauldin, SC Train Show page for the Carolinas Division. Added the Dolls and Trains Show page for the Carolinas Division. Updated the Great Train Expo Show page for the Georgia Division. Added the AMROC Show page for the Carolinas Division. Added the NMRA Show page for the Georgia Division. Added the Coastal Carolinas Show page for the Tidewater Division. Added the Coastal Carolinas Show page for the Carolinas Division. Added the Greenberg Show page for the Tidewater Division. Added the East Tennessee Division and Northern Florida Division pages. Updated the Georgia Division schedule. Added more pictures to the TCA Show page for the Carolinas Division. Added the TCA Show page for the Carolinas Division. Added 3 more videos to the Wayne Beachy Layouts and Trains page. Added Andy's picture to the About the Tidewater Division page. Added pictures to Paul Sharp's layout page. Added the Wayne Beachy Layouts and Trains page. Minor updates to various pages. Added Show Schedule for the Georgia Division. Added Neuse River Valley Club Show pictures and video to the Carolinas Division Recent Shows page. Added GTE show pictures to the Georgia Division Recent Shows page. Added videos to the Carolinas Division Recent Shows page. Added Paul Sharp to the Tidewater Division Member's Layouts. Updated dates on the Carolinas Division schedule. Added picture to the About the Tidewater Division page. New webmaster - Marvin Thiel - Member of the Carolinas Division.